Mac users seeking ways to keep files and folders hidden on their Macs have a plethora of options. Some options, like sparse images, are built right into Mac OS X. Others, like Nova Media’s Übermask , compliment OS X in a logical, helpful manner. 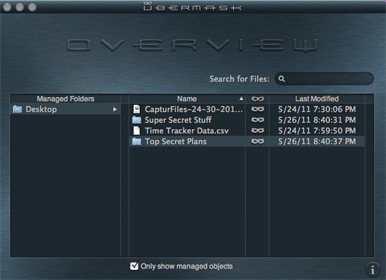 Übermask allows users to hide files or folders from view by rendering them invisible to Finder, Spotlight and even popular add-on utilities like Quicksilver and Alfred. It does this by working continuously in the background. Files remain hidden even after Übermask is closed because you must input your OS X administrator password each time you open Übermask, thereby granting the program the ability to hide files continuously. Übermask will appeal to power users used to using keystrokes to streamline tasks throughout OS X. This is because Übermask’s main hide/reveal commands are tied to a pair of keystrokes which control the application. These keystrokes, dubbed the Übermask and Boss keys, allow users to hide or reveal files with simple keystrokes. These keystrokes allow users to hide or reveal folders directly from their keyboards. When it is open, Übermask lists all files and folders hidden throughout your Mac. The files remain in their original locations, however, so Übermask acts as a guide to your files rather than storing them locally. When you click a file in Übermask, you are taken to that file’s location in the Finder. You can also view or hide Übermask controlled files from within the Finder itself by pressing either of the Übermask keystrokes. Perhaps the only downside to using Übermask is how easy it is to forget about files or folders after you’ve hidden them. Indeed, Übermask’s set-it-and-forget-it methodology works so well that it is quite easy to forget which files you’ve hidden away until you open Übermask again. Übermask is a Gem of a Mac app thanks to its seamless integration with OS X and its ease of use. It’s worth a look for anyone interested in hiding sensitive data on their Macs.